Happy Wednesday! TGI(almost)F! I’d like to give a big congratulations to the winner of the second NoshGirl Chef Challenge! 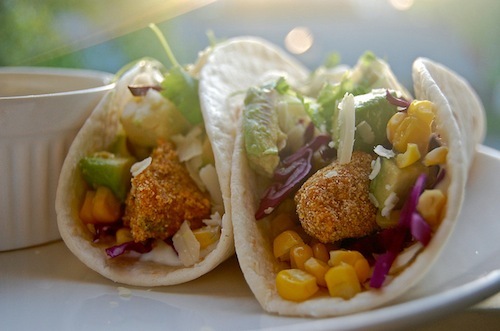 Rochelle, of Daily Bread, wowed voters with her recipe for Fish Tacos With Avocado Tartar Sauce – with a whopping 49 votes (48 comments plus one email-in vote)! Voters appreciated the the incorporation of the two mystery ingredients – avocado and cornmeal. Congratulations, Rochelle! Two authentic NYC black-and-white cookies will be making their way to your doorstep! Note: My bad! I closed the poll prematurely! Since I declared the winner early through no one’s doing but my own, I will reach out to all contestants directly to make it right. Thanks again! congrats to everyone–it all looked delicious! Yay! I voted for these so I'm super happy they won! Congrats! This picture looks amazing; my mouth is seriously watering. Yummy! I love fish and this is fabulous.